A few years back, around 2013, I was introduced to an area of high strangeness through numerous radio talk shows. This particular area was dubbed the, “New Area 51” by some researchers. The History Channel's UFO Hunters TV show did an episode of this area. In addition, the Goshute Reservation is located close to this particular area. What’s this mysterious area it called? It’s called the Dugway Proving Grounds. Read on to see "What's up" and around The Dugway Proving Grounds. Being a researcher and having just moved to Utah, I knew this was going to be the next adventure for my fiancé Michael and me. A few months after settling into our new location, Dugway was calling and we set off in November of 2015 to see for ourselves what secrets it might reveal. As we exited off, I-80 turning south to Dugway, I immediately saw similarities with the valley and the topography of my home state of New Mexico. It felt eerily familiar. The valleys location itself is isolated, as perfect as an area can be for high strangeness. The two lane road is situated with the valley and mountains circling from east to west. The only evidence of civilization is a few houses and a ranch that has stockyards full of cattle. It seems oddly out of place because of the intimidating and unfriendly vibe that comes off the land itself. The land seems scarred in some ways. How can it be any different with the biological and chemical testing done at Dugway? The two lane road eventually leads to Dugway with its high fences and signs that state it is a restricted area, no trespassing with the words, deadly force authorized to get your attention. There is nothing else around the entrance of the base except for a Mormon Ward house. The two together seem on the strange side but then again the base is located in Utah. 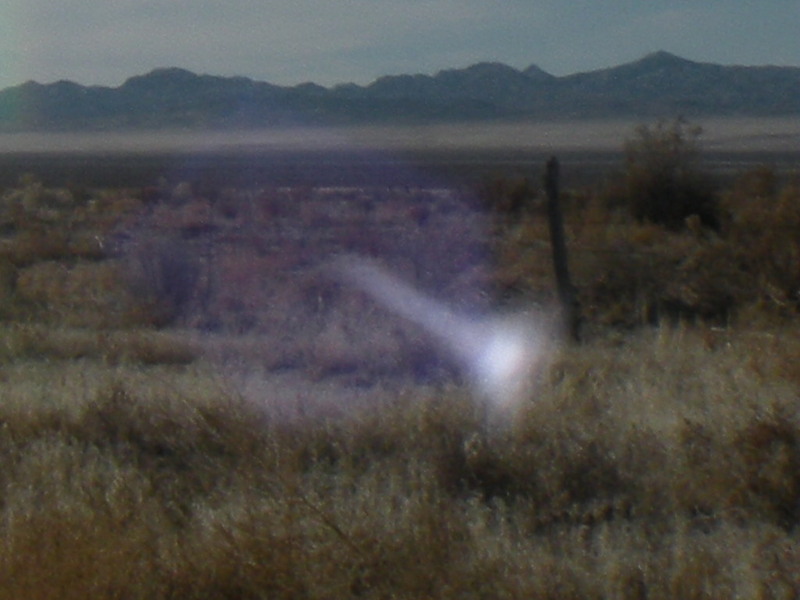 Could Radielli's Orbs be directly related to the Marfa, Texas luminous phenomenon, which also "occupy" a Native American reservation? On our first trip to Dugway, not much happened except we thought we were being followed by a white SUV with tinted windows that seemed to race behind us, stay behind us and then zoom past us at high speed. Intimidation or just someone heading home, you be the judge. That trip seemed to be a catalyst for another visit a month later. The second time around was much different than the first. I felt as if I was being summoned in a way which made me look like I was a bit obsessed with going back. Interestingly enough, it wasn’t Dugway this time that intrigued me; it was the valley area the Goshutes call, Skull Valley. I felt a presence or some kind of intelligence urging our return. Michael was a little apprehensive at first but then he realized that there could be something there, waiting to reveal itself. We went back the first part of December. As an Empath, I was apprehensive myself about going back because I didn’t have any idea of what to expect so I was a bit grumpy the day of our trip. I knew we had to take the camera which we do anyways but this time “they” wanted me to take photographs but they didn’t tell me where or which locations. There was this massive valley in front of us and there didn’t seem to be any guidelines or directions. With that being said, I got out of the car and started taking photos. As we went along the two lane highway, I took photos mostly from east to west. The day was partly cloudy and I started taking photos around noon or a little there after. Since I was aimlessly taking pictures of the landscape, I had no idea if anything would show itself. 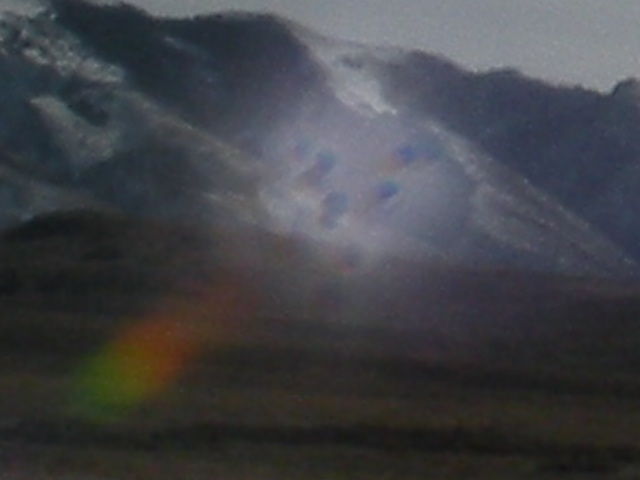 As I got back into the car and started to look at the photos I had just taken, something magical happened, unusual shapes started to show themselves in areas of the photographs that were low to the ground or off to the side and some were in the sky. As far as the images I captured, Michael was in the shower a few days later and he was empathed an immediate name for the images, “Plasma Photon Vehicles”. It sounded good to me. It seemed to the both of us that our trip was a success. I think any good researcher has to go back and investigate even their own findings. Both Michael and I knew we had to go back and see if we could get the same images, or find out if it was some weird glitch in the camera. Our third trip out to Skull valley happened in February 2016 during the same time frame of day and weather conditions. Michael’s camera seemed to work fine and to his knowledge especially with him taking photographs with it for years, the camera seemed to be working fine. I must admit, I had assumed that the same images would appear again and to my surprise … they didn’t. We didn’t get anything like in December, only a few anomalies. This at least proved for Michael and I that I did in fact capture something unusual that couldn’t be replicated. The third time around, I didn’t feel any push to go there. As a matter of fact, I haven’t felt anything since that second trip. The images themselves seem to speak through the camera. I think they can be anything from energy beings to spheres to plasma photon vehicles. I wouldn’t say orbs because I have photographs of amazing orbs from Egypt and at home. The universe is so vast that there is no telling what is out there. I’m just glad we listened, traveled back and have the images to share with everyone. As for another trip out … . Who knows what will call out to us and what we will photograph next?! This is a first in a series of articles based on photographs taken at different sights in Utah. We hope to keep up our research into the unknown.